My kids were a bit squirrely this morning. We were waiting for a phone call*, so I couldn't take them outside. I thought - let's bake! 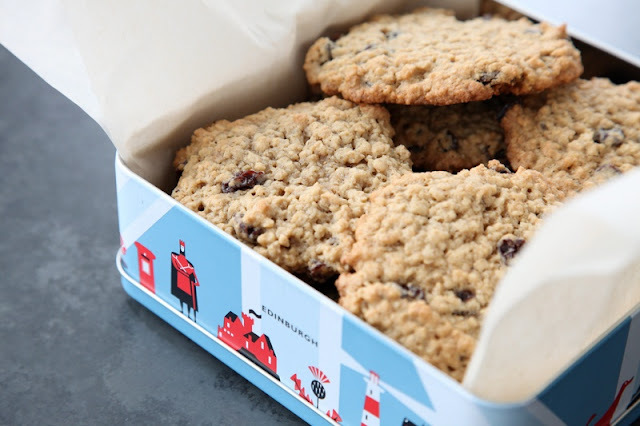 Now I have to resist the allure of homemade oatmeal raisin cookies! For now the cookies are packed away in my favorite tin (thanks Aimee!). I am sure I can withstand them for a few hours. ** I will send them with my husband to work tomorrow! The 'sugar-free life-style' was, over time, replaced with 'eating-as-clean-as-possible-but-without-rules life-style'. What that means is, I really wanted to be able to eat greek yogurt and chinese food so I had to make some exceptions. Exceptions are not excuses! Honest...I looked it up! Exception means living life and going with the flow, excuse means sneaking treats after everyone goes to bed and pretending that it was the only sensible thing to do because you are so HUNGRY! Sweets got the best of me on a few occasions over the holidays, but I said no to dessert several times too! I am eating more vegetables. I drink one regular espresso a day and tons and tons of water. I avoid juice, cheese, processed stuff, and most bready-starchy things. I am 3 lbs heavier than at the end of summer. My current weight is 128lbs. I have been exercising regularly for 5 weeks, including some weight training, so maybe things are shifting around. We don't walk as long or as often in the cold, and I nurse the baby less frequently, so maybe I am not burning the same number of calories. Anyways, I have a goal: flat midsection. Right now I feel like it is impossible. I am eating mostly right, I am exercising, but the changes are sooo slow. Since it's a new year, I will make a resolution: GIVE IT TIME! Give it enough time (a year even - why not? ), to let changes happen. It won't be over night - so don't give up on yourself! Happy New Year!! Thank you for a great 2012! ps. 1+1=2 ...my son is leaning into my desk chair to insert his head between my face and the screen asking what does 1+1 make. Time to think about something other than the blog (or the cookies) or my midsection! Ta! pps. I learned a lot about what is in my food by quitting sugar. I started reading labels. With interest. We made a few simple changes in our diet that will be easy to maintain!